Stir fried recipes are great because they are fast to make and you can easily substitute the vegetables in this recipe for the ones you already have. Add the sirloin (not the marinade) to the hot oil, stirring constantly until beef is cooked to your desired doneness. Remove the beef from the skillet and set aside. Add the broccoli to the skillet (or wok) stirring constantly for about 1 minute. Add the mushrooms and green onions to the broccoli, stir well and cook about 3 minutes. 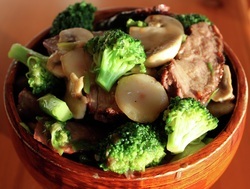 Stir the water chestnuts into the broccoli mixture. Stirring constantly, cook 1 more minute. Broccoli should be crisp but tender. Remove vegetables to a bowl. Set aside. In a small bowl combine the chicken broth, soy sauce, brown sugar, sesame oil, ground ginger and cornstarch, mix well. Return vegetable mixture to the skillet (or wok). Add the sauce to the vegetable mixture, stir well, and add the cooked sirloin. Stirring until sauce is thick and beef is heated through.